Since µMatrix has been getting some attention here recently from a number of posters, I think it's time for a dedicated thread here about it, and explaining what it is and isn't from a user's standpoint, as well as some basics how-to. So I tried µMatrix dev build in a new profile in Firefox 37.0.2 alongside NoScript (default NS configuration), just to get a feel for what it is and how to use it. Some NoScript users may want to use µMatrix alongside NoScript, so some information here can't hurt. 1) Outright blocks all domains listed in a HOSTS file. type can also be cookies, which doesn't affect requests but controls whether cookies can be set. If type is script, it should block inline scripts too. I have not played with the referer spoofing nor the Strict HTTPS (forbid mixed content) feature. Parts of the interface are somewhat difficult to figure out... and the documentation is either lacking or hard to find, so here is what I figured out about it that I don't think is necessarily self-explanatory or easy to discover. - In the pop-up, there are a bunch of red and green cells. Red = Blocked, Green = Allowed, Light Red = Blocked (inherited), Light Green = Allowed (inherited). Click the top half of the light-colored cells to explicitly set an Allowed status, and the bottom-half to explicitly set a Deny status. Otherwise, just click the cell to toggle that permission status. - Click the cell in the very top left (either blue or black) to set the scope of the rules being edited in the popup. - Once you have made the changes you want, click the lock to save them. If you UNblocked anything, you need to use µMatrix's own reload page button in its panel, otherwise the "blocked" state will be cached on reload. Mostly pretty self explanatory, except for the "My rules" tab. There, you see "Permanent rules" on the left and "Temporary rules" on the right. The way it works is you modify the "Temporary rules" then you "Commit" to save the changes and update "Permanent Rules". To actually make modifications: click on a single entry in Temporary rules to mark it for deletion; or, click "Edit" and manually type rules. to let NoScript manage script permissions. I'm not an experienced µMatrix user, so if I got something wrong, please let me know. Something that is really bothersome with Umatrix, that is some websites are completely blocked by Umatrix. Some of these are "finance" website links off of Yahoo finance that I've been using for years. 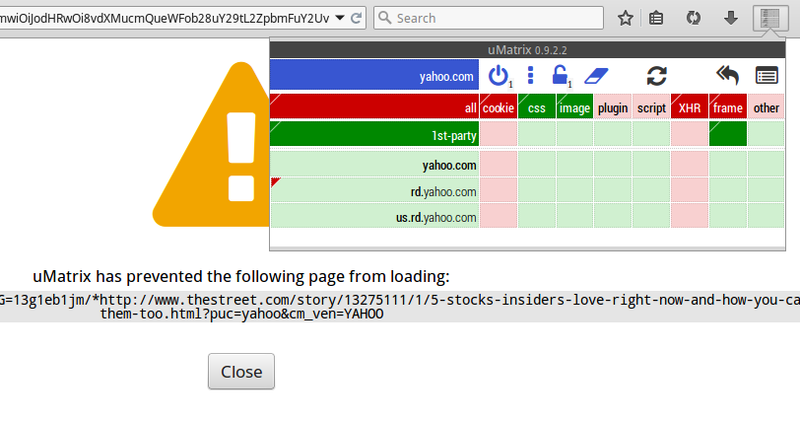 The page using the top link (what a user gets if clicking on the link in Yahoo) is not loaded at all and I get the message: "uMatrix has prevented the following page from loading" (referring to the above page). There is no way to allow anything because the page is blocked outright thus nothing provided to the user to "adjust". How does one prevent this from happening? Why is Umatrix blocking the site (I know, presumably for security reasons, but as I said I've been linking to this source "www.thestreet.com" off of Yahoo for the past 10+ years with no problems)? One would assume that Umatix apparently assumes this website to be extremely high risk. Well I would have to say I find that odd considering how much I've used the web site through the years. I don't want to reduce the security globally that Umatrix provides of course, but it would be nice if Umatrix would provide more information on this instead of just the message I posted above and it would also be more "friendly" to also provide ways to allow the website. Also I might be wrong about this, but it seems like some of these links are eventually not blocked later on (but I can't currently verify that as of now). Thanks for any help in advance on what to do about Umatrix totally blocked websites. Last edited by lakrsrool on Fri Sep 11, 2015 3:59 pm, edited 2 times in total. Check if it got listed in one of µMatrix's HOSTS files or other auto-downloaded blacklists? barbaz wrote: Check if it got listed in one of µMatrix's HOSTS files or other auto-downloaded blacklists? In regards to just "HOSTS" files: According to Umatrix there are 75,729 distinct blocked hostnames within 7 different services. So are you saying I'd have to search each of the 7 services to find this. And if so what do I use as the "search" criteria? One a side note: One wonders if this is all worth it for security reasons. I never could get the video to work on that web site (using the link I got to load) even though I allowed ALL permissions in NoScript and completely disabled Umatrix for that pages scope and still can't get the video to work like it will in my IE browser without any NoScript, Umatrix. I find I have to have IE available to test to see what a website is supposed to do with all of the security levels I've got on the Firefox browser I usually use. It really does become cumbersome to have to use all of this security and would sure be nice to just use the internet the way it was intended. OK I took "us.rd.yahoo.com" figuring removing this part of the URL allowed the website to work in Umatrix and searched all 7 of the Host service blockers and did not find this value in any of them. I am not aware of any "blacklists" of any kind, I know I haven't set them and can't find any reference to this in Umatrix. If you're referring to what Umatrix says at the bottom of their interface well it says there are 23 blocklisted domains, but that doesn't help me much because I have no way of knowing what domains their referring to and not that I'd necessarily want to, but the user can't do anything about this through the Umatrix interface anyway. It is apparent that Umatrix needs a lot more "Help" contents made available to users (like is found in NoScript for example), it is far too esoteric in the manner in which it works. Do you know of any user help files provided by Umatrix to users? Last edited by lakrsrool on Fri Sep 11, 2015 1:12 am, edited 1 time in total. Off of the topic on how to make uMatrix allow the website to even load (stop Umatrix from blocking the entire website) I'm finally able to get the video to work (this is with Umatrix scope disabled). I had to continue to enable more and more sites as they showed up in Noscript each page reload that probably ultimately totaled easily 45+ sites (had to scroll quite a ways to see full list) and also had to keep Umatrix disabled for that scope and I disabled all of what Disconnect blocks as well as what Avast web security blocks and it finally took my disabling the add-on Ublock altogether to get the video to work. So I understand the concept is to only allow the bare minimum that is required to make a website work, but as you can see the possible combinations to know what the actual "required" sites are to do this it would be something like 45 to the 45th power I suppose, in other words a huge number that would take me literally many weeks of 12 hour days to determine and that is with keeping the Ublock add-on disabled and Umatrix disabled for that websites scope. To then figure out what needs to be allowed in Umatrix and then figure out where Ublock is causing a problem clearly makes trying to make a website safe and allow only what is necessary to have it work properly is not just bordering insanity but literally is insanity considering the effort needed to do so. I am understanding what the concept is, right? That is to only allow what is really necessary for a website to work in order to provide as much security as possible? And of course virtually all of the sites that are part of making up a website have a myriad of opinions as to whether they are safe or potentially malicious at some level which seems to depend upon personal "subject" opinion more than anything. It does in many ways when it comes to websites like this to be an extremely nebulous endeavor to find an optimum level of security in these cases. I run into this from time to time and in many cases it's a website that I've been using or sometimes decades to do financial research which worked just fine and apparently gave me no problems until I installed the Umatrix add-on. (although in this specific case it seems NoScript was also involved which I've been using for years). "rd.yahoo.com" is listed in hpHosts. To override the block, it's just a matter of bringing up the matrix while on the warning page, and override the block rule by just clicking on it. Force a reload from the matrix will cause the blocked page to reload with the new override rule. Click the padlock to make the override permanent. If you want the override to apply everywhere, not just "yahoo.com" , don't forget to select the global scope before creating the override. I apparently wasn't able to find it in hpHosts because I was looking for "us.rd.yahoo.com" instead of "rd.yahoo.com". I was just curious about how to set to "global" because on the point of a "global" change in this case I wouldn't want it "global" I presume because the "thestreet.com" website itself is not what is blocked but instead the website gets blocked because it originates (is redirected) from "Yahoo finance" (that being "http://us.rd.yahoo.com/finance/...") so I'd only want to unblock what gets "inherited" from "Yahoo finance" in this case. At least that is the way I see it. What I found a bit peculiar is that if I lock the change prior to reloading then the change is made "permanent" in "my rules". But if I do the Umatrix "reload" as described above in the previous post then the lock icon gets "closed" (usually a "reload" does not "close" the lock image) which surprises me and surprises me even more so because I find that the change is NOT "permanent" in "my rules" (which the closed lock would suggest is the case) therefore requiring me to go to "My rules" and press "Commit" to move the "Temporary rule" to become a "Permanent rule". So it appears from what I can see it is best to lock the change if one wants to make the rule "permanent" (without having to go to "my rules" to do so) as opposed to forcing a "reload" since after the reload one would think the rule was "permanent" (because the lock is closed) when it really is not. This makes me wonder if the lock closing after a forced reload on it's own is a "bug" since that's not how it usually works and is not the expectation but rather all a reload should do is reload (repaint the page) according the the "temporary" settings that would typically still require the user to click on the lock to make it permanent. In this case the reload made it "look" permanent because the lock is closed yet it is not permanent because it remains a "Temporary Rule" only in place until the browser is closed because the "Temporary Rule" will not persist for the next time the browser is started again. So if a forced reload is done the user will have to go to "My rules" to make it permanent because of the fact the lock is closed at that point and therefore the user CANNOT lock it using the Umatrix icon interface thus requiring the user to go to "My rules" to have the rule made "permanent" which is why again as I said it seems like a "bug" to me to actually "close" the "lock" when the forced reload is done in this case. All of this that took probably a total of 8+ hours just to get a website to work with NoScript, Umatrix and Ublock (and disabling ABP and Google sites in Disconnect). There is a wiki -- ("Documentation" link in the "About" pane). I warn that uMatrix is for advanced users, and I completely expect that advanced users would find their way to the doc. @gorhill: If you would like to copy parts of my OP to the µMatrix wiki, feel free. I've just noticed that µMatrix has become available for SeaMonkey (thanks gorhill for making it available beyond Firefox). Installed to my browser. In summary, it's the option to sync custom µMatrix rules via the browser's built-in Sync implementation. I also have a question, how to disable the placeholders? They can make µMatrix detectable by web pages. EDIT Can partially disable by checking "Collapse placeholder of blocked elements", but this leaves behind a "display:none ! important;" on the element. At least this way it can't be detected as µMatrix. EDIT3 Now it's mysteriously working? EDIT4 Ah, got it (partially). Make all extensions.umatrix.placeholder* about:config prefs to blank user-set string, then restart browser. Except that it's setting the placeholder document back... EDIT5 However that's not webpage-detectable AFAIK, all attempts to tryr are coming back with "Permission denied". So I guess this quirk not matter much. - The order of "My rules" seems immaterial. The only way I've found to figure out what's taking precedence over what, is to look at the matrix. - To go to the dashboard from the panel (at least in SeaMonkey), click the "uMatrix 0.9.3.1" bar at the top. barbaz wrote: (thanks gorhill for making it available beyond Firefox). I believe he supports Pale Moon, too.